The comics world lost a key talent last month, but only found out this week. Though he had not written comics for a few decades, Michael Fleisher’s contributions to the Bronze Age had a long-lasting impact. He passed away on February 2, 2018 at the age of 75. Maybe you didn’t know his name, but you know his work. Though Fleisher did not create either the Spectre or Jonah Hex, his runs on both characters informed every interpretation that came afterward. A gifted collaborator, Fleisher scripted both Jack Kirby’s 1975 Sandman and Steve Ditko’s Shade the Changing Man, characters that heavily influenced Gerard Way’s Young Animal imprint at DC. 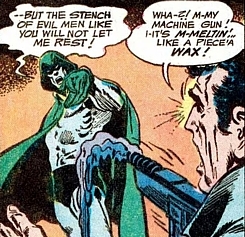 His 10 issues of Adventure Comics that featured “The Wrath of the Spectre” redefined (or perhaps reinfused) the ghostly guardian into a figure of righteous vengeance whose punishments were extremely poetic and strictly Old Testament. Instead of a pillar of salt, a murderer might be turned into a wooden mannequin and chopped up for firewood. One thug was stabbed (off-panel) by a suddenly giant-sized pair of scissors, with a most satisfying and spooky “CHUNK” sound effect. It was this version that Warner Bros. Animation chose to adapt for their animated DC Universe shorts, perfectly voiced by Gary Cole. The barely contained rage in those 10 stories also heavily influenced John Ostrander and Tom Mandrake’s later series. 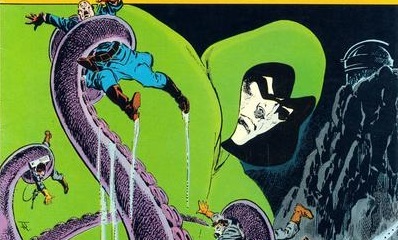 And when it comes to Kirby and Ditko, you’ve just got to read for yourself. Both the Sandman and Shade the Changing Man are weird and wonderful characters, and though they sprang from two incredibly creative artists, it was Fleisher who made them readable.